Tuscany is a land of traditions, history, fields of sunflowers and breathtaking views. The characteristic countryside, which makes this land the most popular destination for couples all over the world, will welcome you with its postcard landscapes, its warm sun, the vivid colors of the vineyards and olive groves, the streets lined with red poppies. Tuscany also offers cities of art, mountains and woods, medieval villages and archaeological sites, and a wonderful coast and sea. So why not enjoy it all, combining the celebration of your wedding with a journey to discover its places? For those who dream of a romantic wedding, the Chianti area offers splendid medieval villages surrounded by ancient walls and stone towers, such as Volterra or San Gimignano, which can be the ideal attraction to breath history and culture. 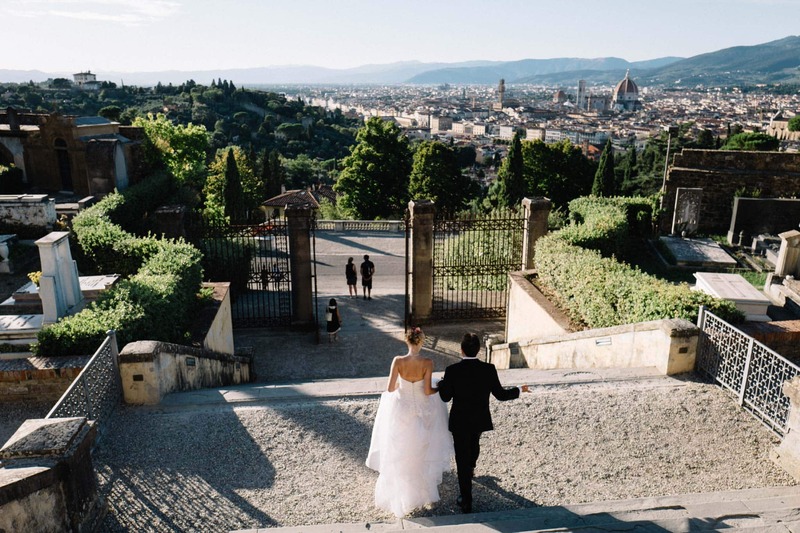 The Tuscan capital city, Florence and its surroundings are full of palaces, Renaissance villas and castles which can be the ideal setting for an elegant and formal wedding. For those of you who desire a Country Chic wedding, your perfect place is probably the Siena countryside, among the Crete and Val d'Orcia, or the Maremma, where you can choose a wonderful farmhouse or a typical holiday farm immersed in the pure nature. But in Tuscany there is a splendid coast as well and, if your dream is a ceremony on the sand at the sunset, then you can opt for Versilia coast, the trendiest destination since ever, or the coast of Maremma and Argentario, which offer beaches where it is possible to get married by the sea, even with a civil ceremony. With its variety of locations, Tuscany meets all tastes and needs, and is the perfect place for any type of event. Florence is a popular destination throughout the whole year, as are its venues. For example, Villa di Maiano, with its breathtaking view of the city skyline, offers beautiful gardens and a panoramic terrace suitable for hosting outdoor events, but also has wide interior spaces including a suggestive lemon-house. Alternatively, it is possible to rent a private villa for a few days or a week, such as Villa Le Fontanelle, where you can have the exclusive use of the property throughout your stay, feeling at home in a welcoming and full of charm environment. On the other hand, in the hills near the city, Castello di Vincigliata dominates the landscape and is an excellent place for those who want to feel like a princess for a day. The countryside certainly offers different scenarios, with splendid Medici villas, farm houses and medieval villages. If what you are looking for is the exclusivity of a village, we suggest Il Borro Relais & Chateaux, which combines the history of a medieval village with luxury, with its suites, spa and swimming pool overlooking the hills. Even more private and intimate, suitable also for small groups, are Borgo Stomennano, surrounded by greenery and not far from Siena and Monteriggioni, and Borgo Santo Pietro, a 5-star luxury hotel with elegant and sumptuous spaces, near the Abbey of San Galgano. Even from a climatic and culinary point of view, Tuscany is ideal for a wedding in any season. The climate is always mild in all the months of the year. You will taste genuine and traditional dishes, accompanied by a glass of Chianti, and you will discover the beauty of this land that changes color in every season. Tuscany is our land, where Bianco Bouquet was born, and who better than a local team can help you plan your most beautiful day? 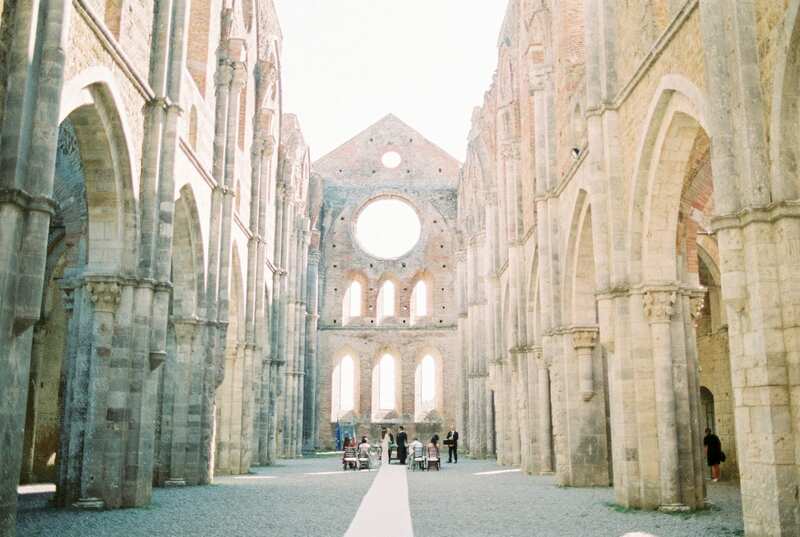 Contact us to find together the right venue for you and to realize your wedding in Tuscany!